If you’re in the process of building a PC, one of the first questions you need to ask is whether you want to use an Intel or AMD CPU in your system. 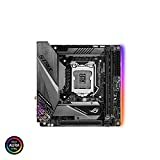 This is due to the fact that this choice will dictate what kind of motherboard you use in your system since the socket type is different with both CPU platforms. There are various Intel Mini ITX Motherboards that are available on the market, some of which are excellent, and others which aren’t that great. A keen favourite in the Intel variety of these motherboards comes from Asus. It’s important to note that Asus make a lot of small form factor motherboards. However, some of these are extremely expensive and in all honesty, very few need the feature sets the more expensive boards provide. Having said that, the Z390-I is hands down the most affordable, high quality Intel motherboard that Asus provides. One of its stand out features is the fact that it has two slots for M.2 SSDs. Given that space can be extremely limited within a mini ITX build, being able to mount storage onto the board directly is a great space saver. Additionally, it has high quality dual band Wi-Fi built in, along with the ability to hook up high speed Ethernet (as expected). It supports a maximum capacity of DDR4 Ram at 32GB in dual channel mode. Cooling is always a consideration in any case, especially when it’s a small one. The Z370-I has three fan headers built onto it to ensure that the system is kept as cool as possible. These are Pulse Width Modulation headers which allow you to change the speed of the fans depending on your own personal needs. Since it is classed as a gaming motherboard, there is of course RGB headers built onto the system as well so you can light it specific to your needs. 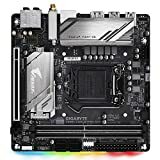 At a slightly lower price point, Aorus are offering the z390i Pro Wifi Board. A nice addition to the Aorus compared to others on the list is that this supports up to 64GB of DDR4 RAM, along with XMP overclocking. Additionally, the Pro Wifi supports Intel Optane Memory should it be the case that you’re using a slower mechanical hard drive and want to give it a performance boost. However, unlike the Asus variant, there is only one M.2 port on the device. Cooling will never be a problem with the Auros thanks to it having 1 CPU fan header and also 2 system headers with you being able to adjust the speeds of the fans to your specification. The system is also able to warn you when it is overheating which is a nice bonus. Connecting additional devices to the PC is extremely easy as well. There are 2 USB 3.1 Type C ports available as well as 6 USB 3.1 Type A ports. Since this board also has gamers in mind, there are a course a variety of different RBG options as well. Additionally, the PCIe slot has been reinforced significantly. This is to prevent damage to the slot when using larger and heavier graphics cards which may otherwise cause damage to the slot. With respect to the AMD variants, MSI have an excellent option in the form of their B450I Gaming Plus AC board. This uses the AM4 platform, although it does thankfully support both the first and second generation of the AMD Ryzen processors. As you would expect from a brand like MSI, it supports various speeds of DDR4 RAM at various speeds. In addition to this, it is possible to overclock the RAM on this board by way of the included A-XMP function in the system bios. Storage wise, it supports one M.2 SSD on the underside of the board as well as having four SATA ports to use SATA SSDs and HDDS. It is designed with gamers in mind and with that in mind, it has special technology included in it to optimise your VR games. In addition to this, is has four USB 3.1 ports on the back as well as dual channel Wi-Fi and 2 USB 3.1 ports to be used on the front of the case. The audio has also been given special consideration, with the board supporting Audio Boost by way of high quality capacitors to ensure that you get the best possible sound at all times. With respect to cooling, it has one CPU fan connector and 1 system fan connector.